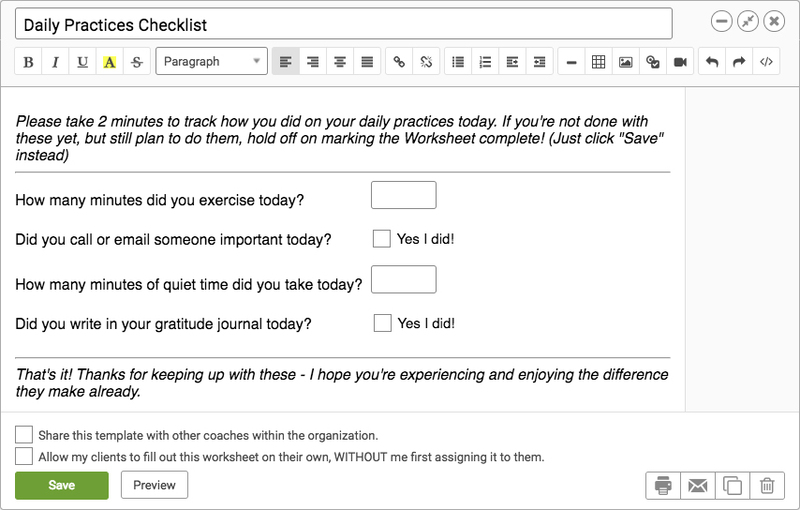 In the two previous posts we’ve covered the basics of using Worksheets within CoachAccountable, and how to wield their Form-Based variant. Now let’s look to the next level of power in using Worksheets: setting them up to have your clients’ answers feed into their Metrics. This is a bit abstract, so let’s consider a concrete example to see how this is useful. A quick warning before we dive in: the ideas to follow are the stuff of putting a lot of features of CoachAccountable together to make elaborate, sophisticated setups to serve your coaching clients. It is cool stuff, but requires a certain familiarity with some of the basic building blocks of the system, like Actions, Courses and Metrics. If you’re familiar with these things already then you’re set, and might be delighted to learn of the fancy, integrated and automated setups that are possible. If you’re NOT familiar, you might want to learn those basics first (though reading on here may serve as good motivation for that learning!). Right then, let’s dive in. You might have more, fewer, or different practices for your participants to take on as part of their program with you. Whatever they are, there are several that are useful and you want to support your people in having these be regular, daily habits. To a large extent these are like Action items to do every day. 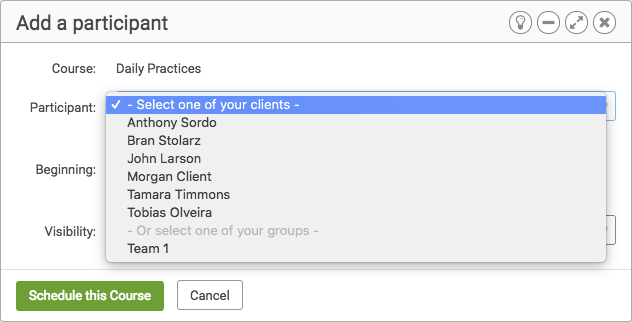 But doing these as Actions would be cumbersome for both you and clients, and clutter up the Actions tab with largely redundant stuff anyway–not a great fit. Metrics would be good: a Binary Metric to track the things that you either did or you didn’t (like the journaling and calling a friend), and a Measurement Metric to track exactly how much you did of a practice (like how many minutes spend exercising and taking quality time). Anticipated time to fill out: 24 seconds. If that. Why did I say “take 2 minutes” in the preamble then? I dunno, some variation of “under promise, over deliver” I suppose. Simple worksheet, right? 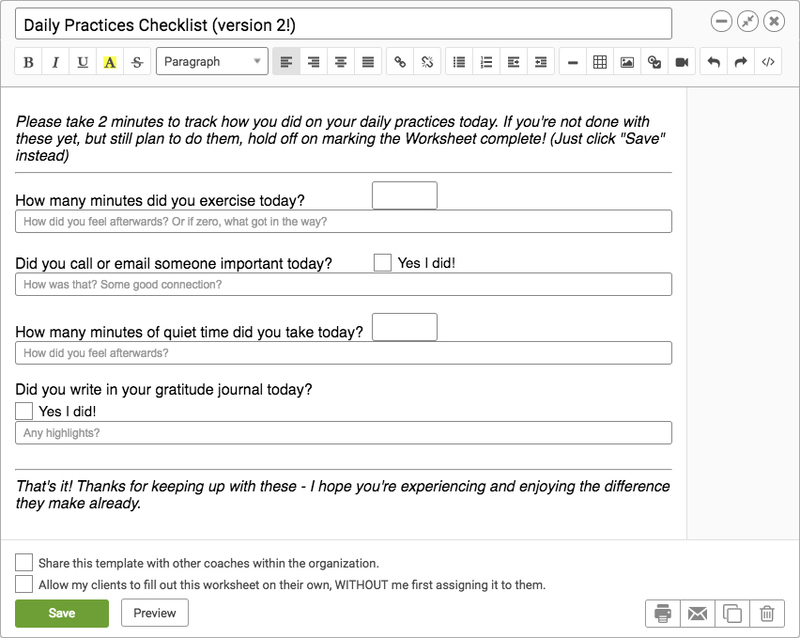 Should be a snap to fill out, and effectively has our clients reporting on how they did on their daily practices (and perhaps more importantly, merely being presented with this worksheet goes a long way to remind/encourage them to actually DO these practices–who wants to fill out goose eggs?). Now then: wading through a stack of Worksheets to see overall performance would be a slog, tough to gauge how a given individual is doing over time. This is where having these tracked as Metrics is ideally suited. So let’s look at how to pipe the answers from this daily checklist into Metrics which can span our 3 month program. The name of a form input is one of those things that doesn’t SEEM important, but turns out to be key for playing with data. 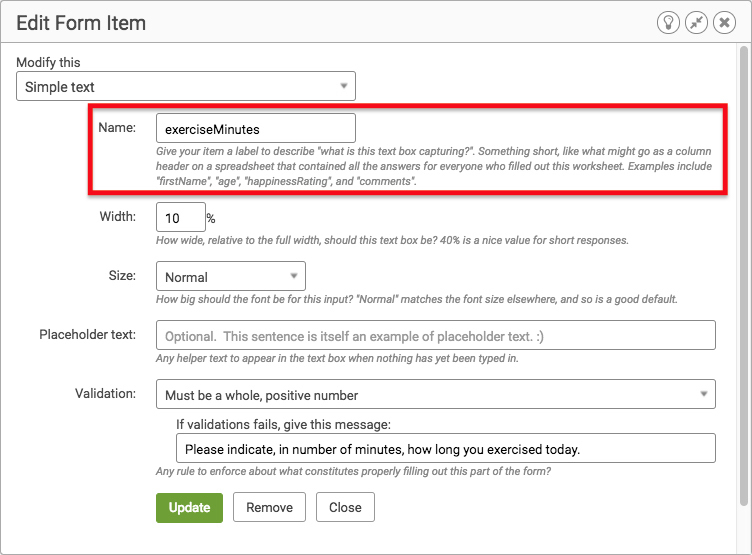 The name of a form input is one of those things that doesn’t SEEM important, but turns out to be key for playing with data.exerciseMinutes is the name we gave to the first input. 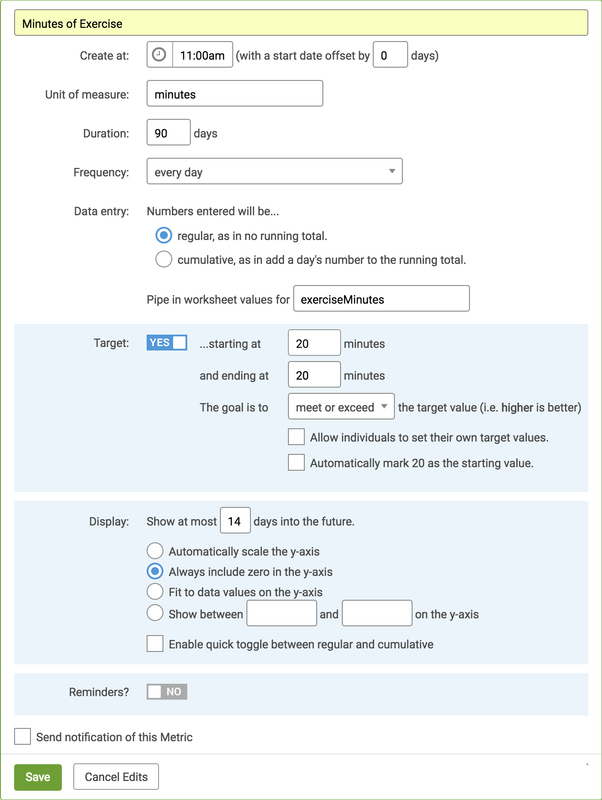 Let’s go now and create a Metric for tracking those minutes of exercise, and set it up so that the filling out of this daily worksheet causes the corresponding daily data point to be reported. Pipe data into this Metric? Ooooh, say more about that. No need to remember what we named our inputs when we made the template, we’re given options to choose from. Since we picked the “Must be a whole, positive number” option for validation (see the “Edit Form Input” figure above), we can be assured that whatever is typed in by your clients for that input will be a sensible data value for this Metric. Metric data points of course are always tied to a date, and the date of a Metric data point (as piped in from a Worksheet) will always match the date that that Worksheet was assigned. So when your client fills out their Wednesday Worksheet, even if they mark it complete one or more days later, doing so will fill in Metric data points for that Wednesday. 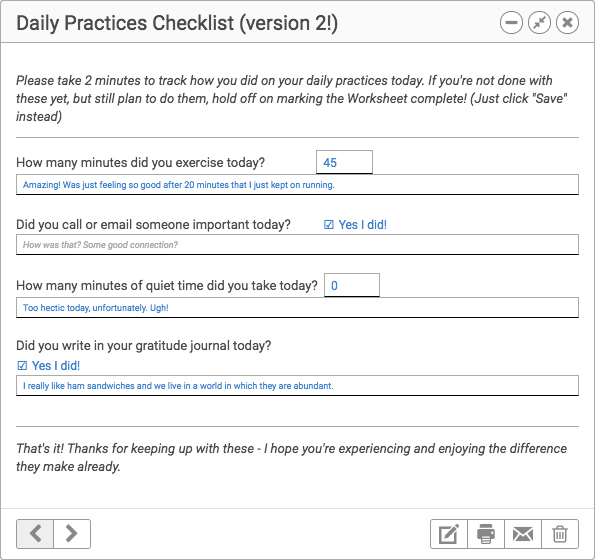 We set up 3 other Metrics to track our other 3 practices: reaching out, taking quiet time, and gratitude journaling. In each case, we choose the right input name from which we’ll be piping worksheet values in. Actual time taken: 8 seconds. Not bad! Completion of the April 11th Worksheet fills in data for that day in the 4 Metrics. 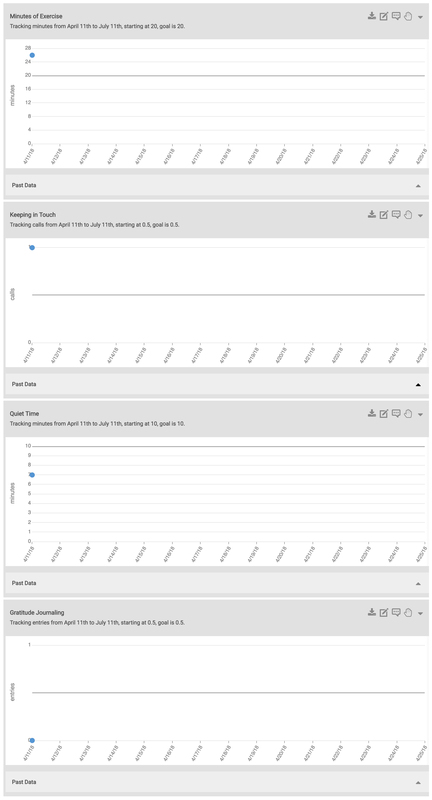 One of the thing that makes Metrics so powerful is that, in addition to the raw number for a given day, they allow your clients to add a brief comment on that number, which helps to tell the story behind a particular set of results. But when Metric data is piped in from our example Worksheet as we have setup, there’s really no place for your clients to type in comments to accompany the numeric values they’re entering. The placeholder text serves to prompt for respective comments. We could’ve also typed out those prompts the old fashioned way, just above the inputs. Stylistic variations, yo’. Now here’s the trick to make it work: the names of our new input items were crafted to match the names of the inputs that are themselves setup to pipe into our Metrics. Specifically, the name of the comment input is the name of the input that is to feed into a given Metric with “_comment” slapped on to the end. 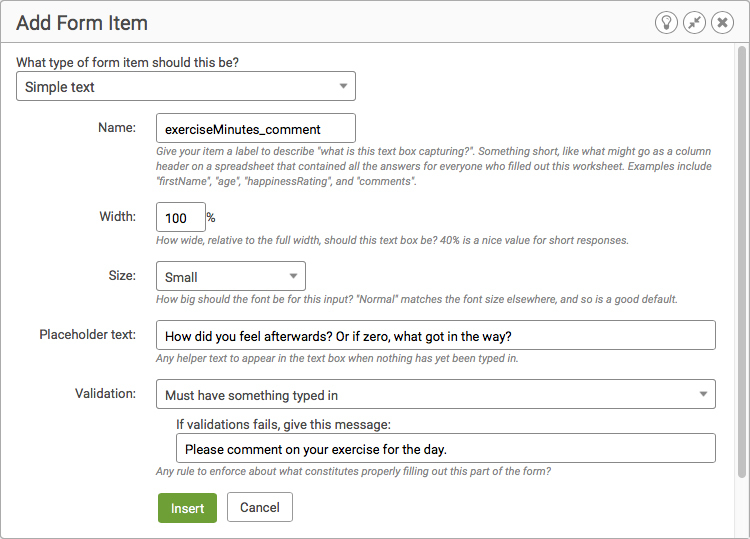 So for example the input for collecting comments on our exerciseMinutes value is exerciseMinutes_comment. Likewise, the input for commenting on the reachedOut value is reachedOut_comment, and so on. The “_comment” suffix on the input name is the key. Adding comments gives more to the story of what we’re tracking. Admittedly now this takes closer to 2 minutes. Hover over the data point for the 12th and indeed we find the comment is there. Nice! 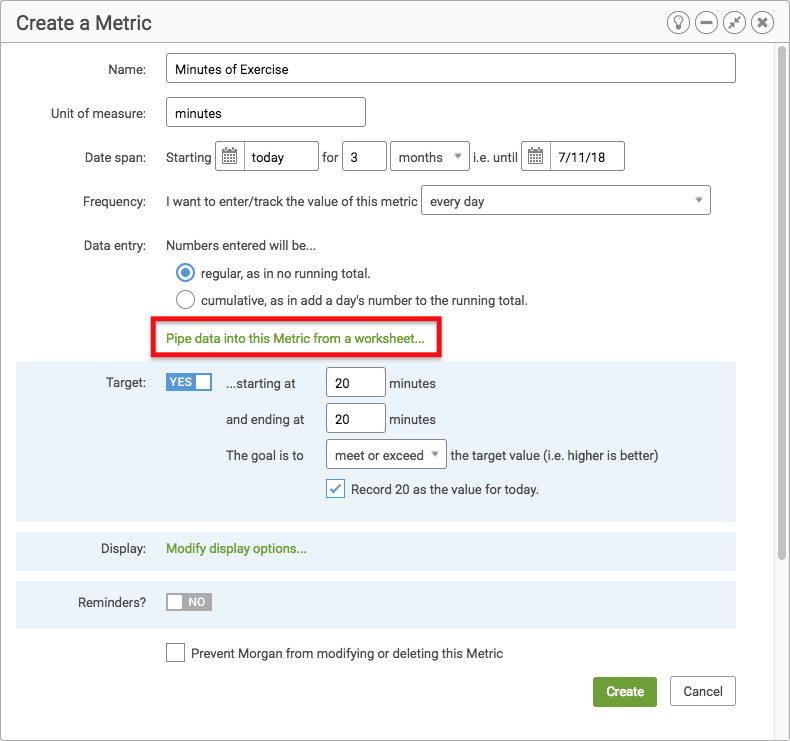 When our client typed a “45” into the exerciseMinutes input, it follows naturally that that was recorded as a 45 in the corresponding Metric. Type in a number, the number is recorded. But what about other kinds of form inputs, can the system infer Metric values from them as well? In the above we’ve already seen one example of an inferred value: the single check boxes. When checked that registers as a 1, when not checked that registers as a zero. This works quite perfectly for having a single check box input pipe into a Binary Metric. As said above, simple text boxes glean their number from whatever is typed in. If it’s not just a number (but instead contains some other, non-numeric text) the system will try to pluck a number out of whatever was typed. For example if your client types “I ran 12 miles!” CA will pull out 12 as the Metric number. If they type “I ran twelve miles!” then well, sorry: I hereby confess the dirty secret, that CA doesn’t actually speak English. As a form input usually reserved for for free-flowing written answers, multi-line text boxes would usually be a poor fit for getting some sort of number out for the purposes of a Metric. But there is one use case that fits nicely: if you are prompting folks to type in a list of something, when how many items in that list is a useful number. The placeholder text prompted “Type in one person per line”, an instruction that is simple enough to follow. In this case if you hooked this input up to a Metric, the above answer would register as a 3, and the inferred comment would be “Dave, Ed, Sally”. Probably 8 is what we should record. With dropdown menus the system will first-and-foremost try to grab a number out of the option that was chosen. In the example above, 8 is a clear winner. If a number cannot be pulled from the text of the chosen option, CA will mark down WHICH option was chosen relative to the ordering of all options presented. In other words, if the first option is chosen that’s a 1, if the second option is chosen that’s a 2, and so on. Nothing personal, bananas. I just wanted to not have everything checked for this example. For the fruits question, 4 of the boxes are checked and so that would pipe into a Metric as a 4. The comment, if not coming from a separate _comment input, would be “Apples, Cherries, Durian, Fig”. In the second one, there are numbers present in each of the options, so CA will use those to add up a total value for the collection of check boxes, counting only those boxes that have been checked. So it would compute as 5 + 30 + -2 = 33 total. The inferred comment would be “Stretch, Go dancing, Eat a corn dog” (in some, but not all, cases the system is smart enough to strip off the points portion to make it read a little more human). In case you were wondering, if some check boxes have a number in them and others don’t, the number will be used when present and otherwise a checked check box will contribute a one. So yeah, feel free to mix-and-match. Blarg. Not actually a word, but it sounds rough, right? The first set of radio buttons lacks anything numeric, so the index of the chosen item is what would be piped into a Metric. In this case “Good” is the 4th option, so it would be a 4. The inferred comment would be “Good”. The second set of radio buttons has numbers in the option, so here CA gloms on to those numbers. In this case 5 would be the Metric value, even though it’s the 3rd option. “Medium awesome” is the inferred comment, as CA is often smart enough to strip off the comment and extraneous punctuation (in this case, the dash that separates the number from the label). At this point now we know how to set up a Worksheet to capture daily reporting (on our positive habits, and more broadly anything to be tracked regularly as a Metric), and how to pipe what our client fills in into one or more Metrics, including thoughtful comments to make this tracking be more informative than just numbers. Now make this super easy for ourselves, let’s make it so CA will send out that Worksheet to our clients on a daily basis, so that we don’t have to (‘cuz yeesh, right? How much work would that be over 3 months?). Fun fact: 3 months is only exactly 90 days if you start it in January in a non-leap year. But whatever. Then we put our Worksheet as an item to go out on Day 1. We tune things to be just right for the stuff of a daily reporting ritual: we have it send out at 11am in order to let some of the day pass, so that they’ll have something to report on (though you could make a case for both earlier and later), we make it due zero days later (i.e. due on the same day) and due late in the day (9pm, but perhaps 11:59pm would be a more suitable leniency? ), and we’ll have the system send ’em a text reminder one hour before it’s due, JUST IN CASE they haven’t already marked it complete by then (if they have, of course, the reminder will not be sent). We notify the client with a nice little message that includes the [loginLink], which is a magical way to put them just one click away from having the worksheet front and center, ready to work on with no fuss (any friction we can remove from our clients actually getting around to filling out the worksheet goes a long way towards ensuring that they actually do, so this is key). Assigned at 11am, reminder sent at 8pm, due at 9pm. Perfect. This looks good, so we hit Save. 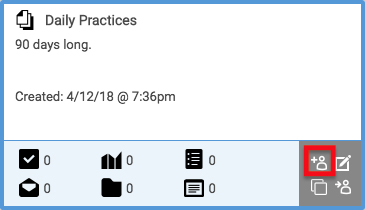 Now we hit the little “clone” icon in the upper right corner of our perfect little Worksheet assignment, and with a few clicks clone this item down the line, effectively telling CA to send out and manage this worksheet assignment for all 90 days of this course. Fun fact: I banged out the feature to clone an item multiple times in a single go while sitting beside a CA customer who had me onsite for a consulting visit. They were working on a similar setup as I am describing in this post, and I figured I may as well save everyone the effort of all those clicks. Onsite visits are super fun, ask me about ’em sometime. 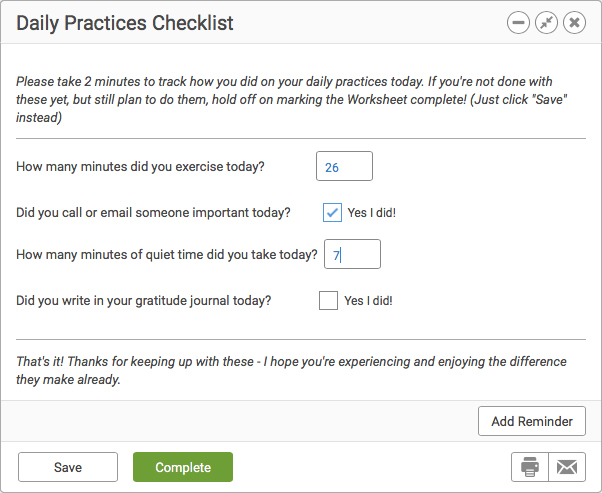 At this point now we have a Worksheet that will be sent to our client every day for 90 days, prompting them in the simplest possible fashion to go and report on their performance for the day. The last step in building our Course is to add the Metrics to Day 1. This will have the effect of setting up the standard Metrics that our 90 daily Worksheets will be piping into. Doing it here means it will be instantly done for every participant who enters into our 3 month program. Things of note include a duration of 90 days, a perfect match for how many daily Worksheets will go out. 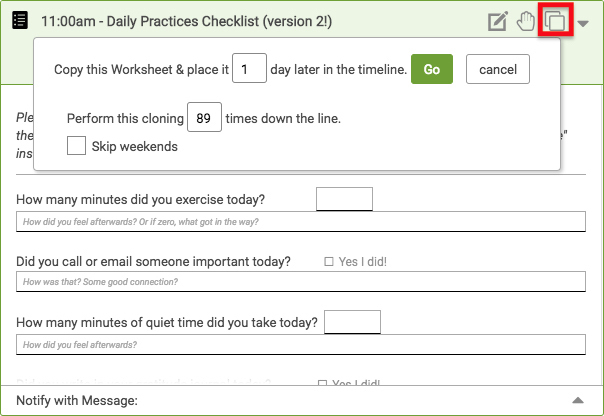 The every day frequency is what we intend, and we’re piping in from the worksheet value of exerciseMinutes, which lines up with the Worksheet input name. We DON’T set a reminder because sending out Worksheet is prompt enough: a reminder for any specific Metrics would be redundant. Similarly there’s probably no need to send a notification of this Metric: the Worksheet send out is notification enough that this Metric (and the others) have been set in motion. Right then, that’s the setup of our Course. We could (and in most cases, naturally would) build upon this Course to include everything else that is comprises your 3 month program, including materials and assignments that are to go out for each of the weeks. But at this point our Course is fully set to manage the Metrics to be tracked. Back in the main Course tab we can set the whole thing in motion for participants of our 3 month program with just a few clicks. Click this Plus Tiny Human icon to add a participant into your course. Set the whole thing in motion with just a few clicks. Adding a participant has the effect of creating whichever Metrics are pertinent, and managing the daily Worksheets by which those Metrics will be reported on. This is a bit off topic, but I’d like to mention that if you really want to have some fun and it fits with your style, try putting a coaching Group into your course. 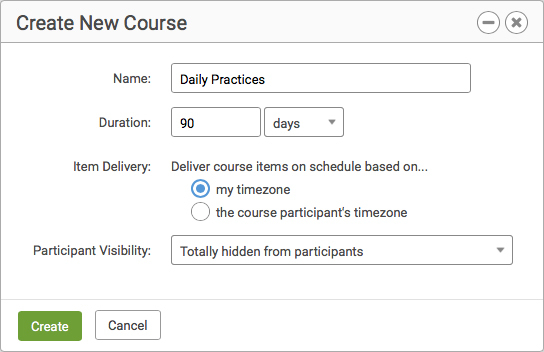 A Group Course like this puts the members into what you might frame as a transparent competition to outperform one another on their regular Metrics (as you have the option to make ALL Metric performance, including aggregate and individual, transparently visible to each group member). Food for thought as you design your programs. Holy moly that was a lot–good on you for sticking with to the end. To recap, you now know how to setup Worksheet answers to pipe into Metrics, which in turn makes possible the creation of highly automated of tracking and recording your clients’ progress throughout your programs, and does so in a way that gently yet persistently nudges them to keep up on tracking (and thus accomplishing) that progress. We’ve looked at doing and reporting done on a daily basis, but all of this can be modified to suit other frequencies, like weekly, just Monday through Friday, and so on. This is powerful stuff. Wield it well and your clients will enjoy a highly supportive program that is uncommonly results-centric, which they will typically recognize and appreciate within the first week. This is SO AWESOME! Thanks a million for doing this for us John! Thank you sir, I’m not surprised that a power user like you would find this such a win! And thanks for the generous public praise here in the comments, when you could have just as easily dropped me an email. I would love to hear what difference this makes for you and your people after you’ve had it in place for a month or so. these is pretty much the exact thing i was looking for and a perfect answer to the question i asked you directly john! I like it and I’m looking forward to trying this out; granted I am just a beginner but I have found everything here super useful so far. This is awesome! I’m working to set up a course, and I’m amazed at the capabilities for easy tracking and follow-through. Thanks!! I am relatively new to the system (1 month) but with each day, I see more and more possibilities. This is a great feature! It’s taking something to adapt my current processes and set things up to maximize the benefit to my clients but so worth it. Thanks John. Hi David, welcome to CA! And you’re most welcome. Yeah, the system does a LOT and it’s easy to miss some of the gems. If you could use some help in setting things up be sure to reach out, myself or my new Director of Customer Support and Hand Holding would be happy to hop of the phone for exactly that purpose. John you are the MAGIC WIZARD!